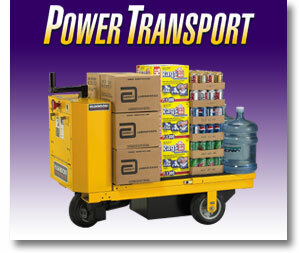 Quietly and efficiently transport all your supplies - ideal for molds and dies, industrial facilities, hospitals and libraries. Electric, solid state power is variable, providing smooth starts and stops. Increase productivity while you decrease workers' compensation claims. Stake pockets and tapped mounting accessory holes are standard on smooth steel decks. Battery compartment rolls out for easy maintenance. Powered by 3 standard marine-type batteries. Optional bolt-on riding platform folds up when not in use or for maneuvering through tight spaces. Base measures 45" or 67" by 29.5" and comes in either hardwood, smooth painted steel, diamond plate, or stainless steel. Optional deck extension (smooth steel only) increases platform length by 12". 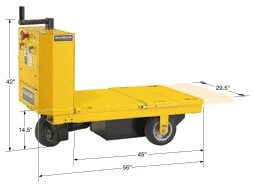 Optional side racks mount easily into stake pockets for safe transport of stacked materials.